Infiniti plans to formally introduce the Q80 concept at the Paris auto show. Infiniti released an image Tuesday of a large four-door fastback concept that signals the styling for a stream of new products planned over the next four years. 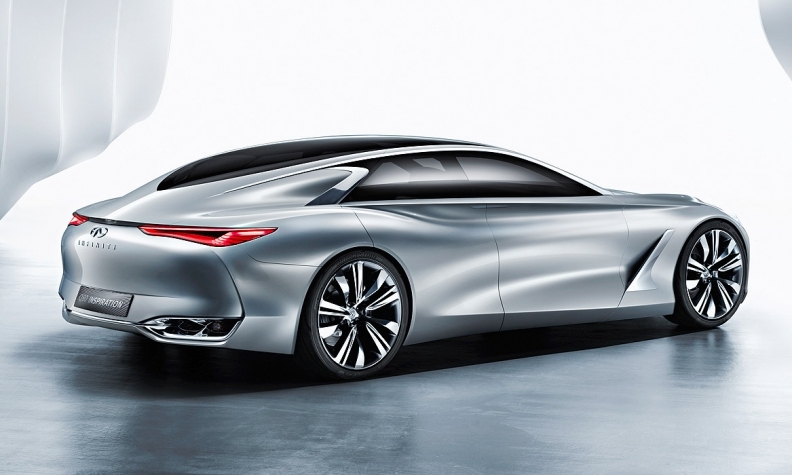 The Q80 Inspiration, which Infiniti said will be the basis for a future model, represents the brand’s largest car. Its 3103mm wheelbase is about 51mm longer than the extended-wheelbase version of its current flagship Q70 sedan. The Inspiration is about 178mm wider than the Q70, but with a roofline that is about 152mm lower. Infiniti plans to formally introduce the Q80 concept next week at the Paris auto show. The introduction will be an early salvo in a product campaign to take Infiniti into the higher reaches of the premium light-vehicle market -- at the same time that the luxury marque is planning new models with a smaller footprint. The two-front campaign -- which will start to take effect in 2018 -- is the legacy of Johan de Nysschen, who served two years as Infiniti president before leaving this summer to join General Motors as global head of Cadillac. The product plans also reflect efforts by Andy Palmer, Nissan Motor Corp.’s former executive vice president, to rejuvenate Infiniti. Palmer also left Nissan over the summer, becoming CEO of Aston Martin. Infiniti isn’t saying how the production version of the Inspiration would be built. But recent comments by de Nysschen suggested it would share Mercedes-Benz’s modular rear-wheel-drive architecture and possibly come with a turbocharged V-6 engine capable of 600 hp to 700 hp. Nissan and Daimler are cooperating globally on future vehicles, powertrains and component design through the Infiniti and Mercedes-Benz brands. The two companies also are constructing a large assembly plant in Mexico that will yield three new but unidentified small vehicles for each luxury brand. The segment is dominated by the Mercedes CLS, Porsche Panamera, Audi A7 and BMW 650i Gran Coupe. The image released Tuesday only indicates a styling direction.